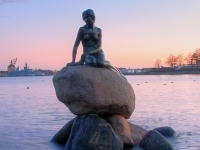 The Little Mermaid sits on a rock at the Langelinie Harbour and is one of Copenhagen's biggest tourist attractions. The sculpture was built in 1913 and enchants over a million people visitors every year. At only about four feet (1.25m) high, she is small and seems to be in her true element when the waves crash against her rock. The sculptor Edvard Eriksen modelled the head after ballerina Ellen Price. The statue is beautifully executed and fits so well into its natural surroundings that it may take a moment to notice it. Of course, Hans Christian Andersen's story of 'The Little Mermaid' is beloved the world over which goes some way to explaining the popularity of this wistful artwork.